Gonzo's Quest is a revolutionary game that was one of the first to implement the Avalanche feature. It has a fast-paced gameplay, nice sounds and animations, as well as an interesting bonus feature. Its RTP at 96% is average and could be a bit better. Gonzo’s Quest is an especially well-designed slot game created by one of the most popular game providers, Swedish company NetEnt, which describes it as "its first platinum video slot game". The game is beautiful to look at, has nice and swift animations and allows its players to win big, especially after triggering the Free Falls feature with increasing win multiplier. Those are just some of the reasons why Gonzo’s Quest became popular right after its launch in 2010 and still remains a go-to game for many players to this date. Gonzo’s Quest follows the story of Gonzo the conquistador in the year of 1541. This explorer arrives to the Peruvian coast on a galleon and decides to abandon his ship and begin his search for Eldorado, the lost city of gold. He steals a treasure map, jumps off the ship and begins his journey. All of that is displayed in the game’s intro. When the intro reaches its end, Gonzo poses beside the game's reels, becoming a constant feature of Gonzo’s Quest. He doesn’t change the outcomes of the spins, but stands there and celebrates with you when you hit a nice win. The theme of the game is based around the culture of Incas, which is famed for its unique architecture and art. The architecture forms the game’s background, while the famous Inca masks take a form of the symbols, accompanied by likenesses of wild animals created in a similar style. All in all, Gonzo’s Quest offers a really unique experience. Great graphics and smooth animations definitely are among the reasons that make Gonzo’s Quest so popular. The gameplay is swift and fast, which only increases the thrill of playing this game. You can enjoy the sounds of blocks falling onto the reels, while hoping for them to form a new winning combination to trigger another avalanche. Note: The Avalanche feature is one of the cornerstones of Gonzo’s Quest. I will explain it later on in this review. However, there is one complaint that many players share. The animations are a bit too fast when using the Autoplay feature. Many players like to look at new symbols falling onto the reels and figure out what exactly they need to form another winning combination. That’s almost impossible to do when using Autoplay, which is a shame, as it decreases the amount of fun some players have when playing Gonzo’s Quest. Gonzo’s Quest simply is a beautiful game with a great mix of animations, 3D effects and sounds that make playing it a very enjoyable experience, which can also be said about many other NetEnt games. Gonzo’s Quest really distinguished itself among other slots with the way the game works. Instead of classic reels, the game has a so-called Avalanche feature, which has symbols fall into the reels from the top. Symbols that form a winning combination get destroyed and make room for new blocks of symbols to fall in from the top. Note: Nowadays, many video slot games work similarly to Gonzo’s Quest. However, at the time of the game’s release, the Avalanche feature was really something that made Gonzo’s Quest stand out from the rest of the games on the market. Thanks to the Avalanche feature, numerous consecutive wins can be achieved in the same game round. 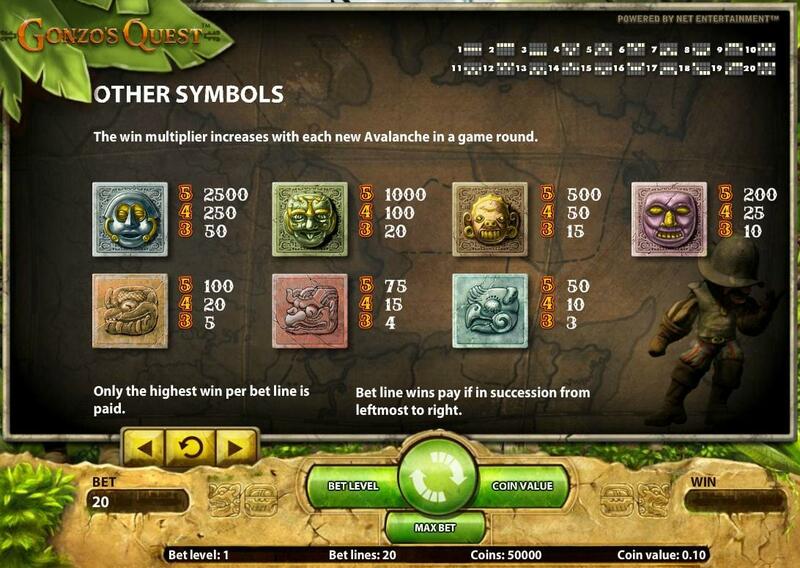 What’s more, every time new symbols are added to the reels, the multiplier increases. Each spin starts with a 1x multiplier (with the exception of free spins). Then it can increase with consecutive wins in the same game round to 2x, 3x and subsequently 5x, which is the maximum multiplier that can be achieved outside of the free spins feature. There are 5 "reels" with 3 symbols each and the number of winlines is 20. You can’t choose the number of active winlines, it always remains "locked" at 20. This makes Gonzo’s Quest not suitable for some of my slot machine strategies, but it makes sense, as the Avalanche feature, which is one of the cornerstones of this game, wouldn’t work very well with fewer winlines. Winning combinations must appear on a winline from leftmost to right. There are 7 regular symbols in the game. They are a bit difficult to describe because of the abstract nature of the game, so I will include a picture with them. Apart from the 7 regular symbols, there is a Free Fall symbol and a Wild symbol. Three Free Fall symbols in a winline triggers 10 free spins (or Free Falls as they are called in Gonzo’s Quest). The Wild symbol substitutes for all symbols, including the Free Fall symbols. The Avalanche feature really is what made this game so popular. It’s the core component of Gonzo’s Quest’s gameplay that makes the game much more interesting and thrilling to play. It can be really exciting to hit multiple consecutive wins in a single game round, just to see the multiplier rise and root for another big win with the combination of old symbols and the ones that have newly fallen onto the reels. Gonzo’s Quest has only one special feature, the Free Falls. Three Free Fall symbols trigger 10 Free Falls (free spins). However, the Free Fall symbols don’t function as scatter symbols, therefore they have form a winline from leftmost to right. That makes the Free Falls much harder to hit, but at the same time it creates a possibility to trigger much more Free Falls at once. Each winline with three Free Fall symbols triggers 10 Free Falls, so you can be awarded with much more free spins if you manage to align them on multiple winlines. What makes the Free Falls special, are the increased multipliers. Regular game starts at 1x multiplier that can subsequently rise to 2x, 3x or to the maximum of 5x. In the Free Falls, all of these multipliers are 3-times higher. That means that each Free Falls starts at 3x and can rise to 6x, 9x and 15x. This means you can really achieve nice winnings during the Free Falls. The Free Falls feature is really interesting for the player, both from the perspective of unique experience and the possibility to hit a big win. However, it can be quite hard to hit, as the Free Fall symbols must form a winning combination on a winline, just like any other symbols. That’s my main criticism of Gonzo’s Quest. It only has one special feature, which is not triggered very often. It doesn’t have any other bonus feature or a jackpot. That can make the gameplay a bit boring for some players, especially after playing some of the newer games with multiple special features that can be triggered in any spin. Gonzo’s Quest has a minimum bet of €/£/$0.2 (€/£/$0.01 per winline) and a maximum bet of €/£/$50 (€/£/$2.5 per winline). Of course, the maximum and minimum bets be different in casinos with other currencies. You control the size of your bet using the "Coin value" and "Bet level" buttons. Note: To simplify the rest of my review, I will choose the currency of $ and use it from now on. The wins will differ based on the currency you play in. All of the wins in the paytable are displayed in multiples of bet per line. The highest possible win per line awards 2,500x the bet per line, which is $25 for the minimum bet of $0.2 and $6,250 for the maximum bet of $50. That’s 125x the total bet, which is not so high when compared to some other slots, but you have to keep in mind the possible multiplier. The maximum multiplier is 5x in regular gameplay and 15x during Free Falls. That means the highest win per line is 625x the total bet in regular gameplay (with the 5x multiplier) and 1,875x during Free Falls. The last number is really nice, as it means a possible win per line of $93,750 when betting $50 and $375 when betting $0.2. On top of that, you have to keep in mind there always are 20 active winlines and you have multiple chances of winning in one game round, thanks to the Avalanche feature. Of course, huge wins like the ones I mentioned are incredibly rare, as basically in any other video slot game. Gonzo’s Quest RTP (return to player) is 96 %. That means that you can expect to "win" $0.96 for every $1 you wager. Of course, this value only works statistically and in the long run, so your results will vary. 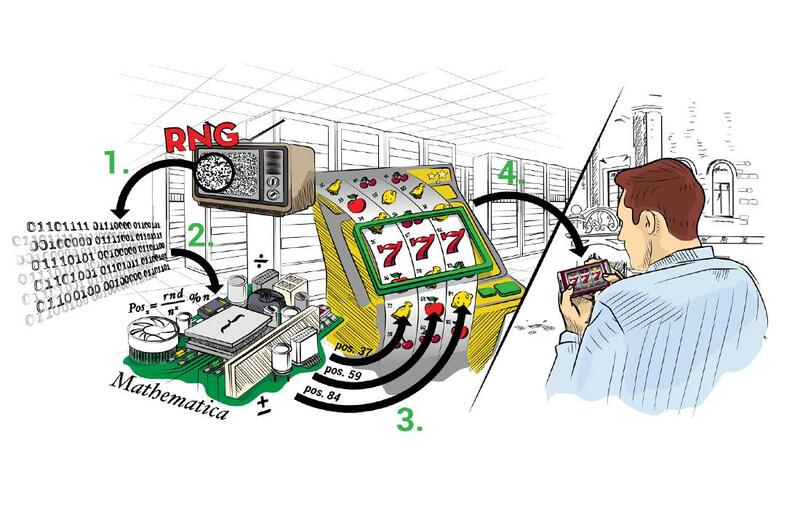 Note: If you are unsure about how RTP and variance of slots work, read more about them in my article on slot machine’s RTP and variance. 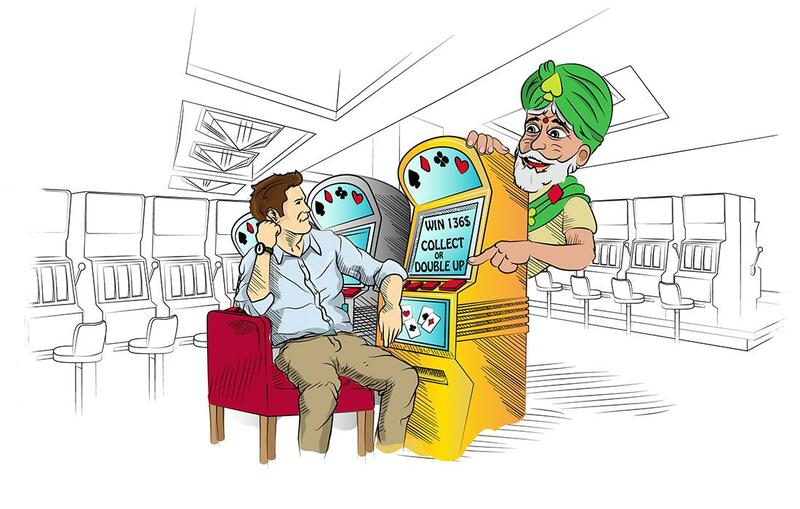 The RTP of 96 % can be considered somewhat of an average in the world of online slots. That means that there are games which are worse for the player in the long run, but there are also many slot games that are much better in terms of RTP. In terms of volatility (variance), Gonzo’s Quest can be considered a medium variance game. That means that the game generally awards medium-sized wins with medium frequency, at least when compared to other video slots. The concept of variance can be a bit difficult to grasp, so feel free to read the article I linked above. Gonzo’s Quest is a very entertaining and popular online slot with a strong position in video slots’ history. It was one of the first (if not the first) games of its kind thanks to the Avalanche feature. Its medium volatility makes sure you win something every once in a while, while you also have a reasonable chance to hit a big win, most often thanks to the Free Falls feature. On the other hand, the RTP of 96 % means that there are games better for the player, however, this value can be considered an average and it’s nothing to frown upon. As I already mentioned, some players (including me) would welcome additional bonus features, as the game can become a bit boring after some time. Want to try it out? 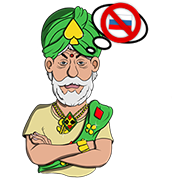 Play Gonzo’s Quest for free on our website and decide whether you want to try it out in a real casino.